Home / Tips & Tricks / Tips & Tricks: How to finish off your prints? There are so many different types of filaments available. PLA and ABS are the most common ones, but nowadays you can also print bronze and wooden items, thanks to FormFutura’s Laywoo-D3 and ColorFabb’s woodFill and bronzeFill. In these filaments, there is a small percentage of wood or bronze, that takes control after printing. Since we test everything before we sell it, we give you some tips and tricks about how to treat the filaments after printing. The wooden filaments are better looking after some treatment. After printing there are some threads or coarseness’s, especially when you print bigger items. The best way to solve this problem is by abrading the surface with sandpaper. When we started treating the big box, we started with sandpaper with grain 120. It is possible to start with a lower grain (60 or 80), since these will make sure the raw feeling of the surface disappears. After the first abrading with grain 120 we did the same thing with grain 180. After this, we simply cleaned the box with a soft cloth to clean the box from dust and remnants. We did this to ease the next abrading (with grain 240). Finally we used sandpaper with grain 320 to finish of the abrading. Then we used the soft cloth again to clean the box. The final part is anointing the print with wood varnish to protect the print from the moist. Just as like the woodFill the prints made with bronzeFill aren’t fully done when they are printed. These prints also need to be treated afterwards, though this is not always that easy when the prints are complex. With bronzeFill we also started with sandpaper with grain 120, going up to grain 180 after the first time of abrading. It is also advised to smooth the print with a slightly moist soft cloth. The next abrading with sandpaper (grain 240) will give your print a more smooth feeling and look. To finish the print of we advise you to use sandpaper with grain 600 or higher, to give your prints that beautiful bronze glow. To make sure this glow is present it is advised to anoint the print with a special copper polish. This will give your print that extra shine and it will give the bronze particles in the print an extra shiny glow. 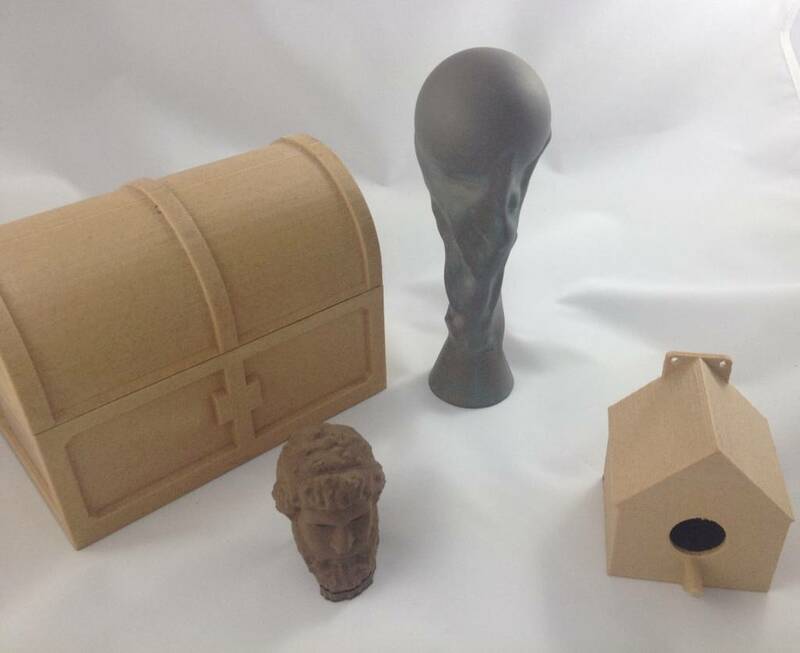 The picture you see above: the box and the birdhouse are printed with wooden filament, the statue and the world cup are printed in bronzeFill. The box and the world cup were treated after printing, the birdhouse and the statue weren’t.